Ousted President Is 'Ready To Fight For The Future Of Ukraine' : The Two-Way Viktor Yanukovych appears in public for the first time since he fled Ukraine. At a news conference in Russia, he insists he's still his nation's leader and says he left after his life was threatened. Viktor Yanukovych, who says he's still the president of Ukraine, at his news conference Friday in the southern Russian city of Rostov-on-Don. 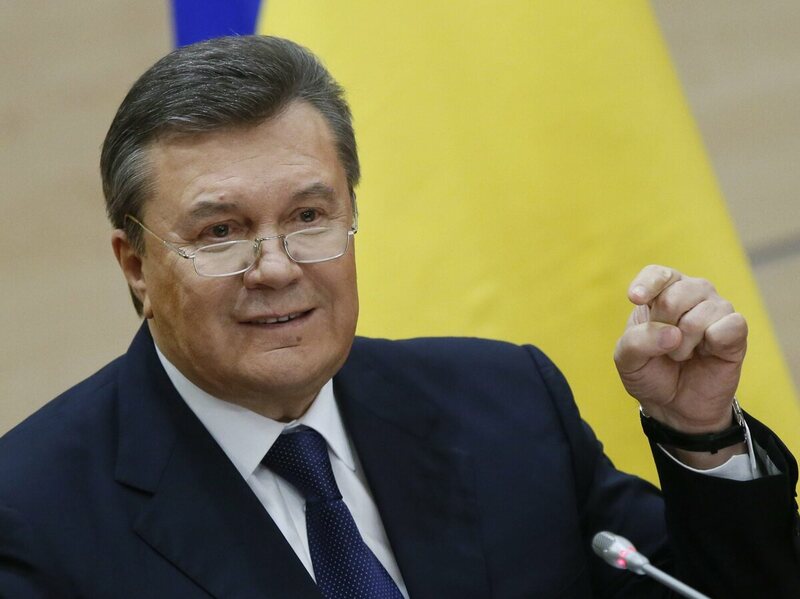 Appearing in public for the first time since he left his nation's capital earlier this week, ousted Ukrainian President Viktor Yanukovych told reporters in Russia on Friday that he is "eager and ready to fight for the future of Ukraine." At a news conference in the Russian border city of Rostov-on-Don, Yanukovych did not speak about using force to reclaim the post that he says is still legally his. "I am not going to ask for military support," he said. He also said Crimea, where the majority of people are ethnic Russians, should not split from Ukraine. "Ukraine should be a single, united country," Yanukovych said. Yanukovych vowed to return to Ukraine "as soon as there will be a guarantee for my safety and the security of my family." But Yanukovych, according to an English translation aired by the BBC and other news outlets, decried those who he said are using "terror and fear" to rule Ukraine and who he said forced him to flee even though he had agreed to a plan for new elections later this year. He referred to his toppling as "banditry and a coup." Yanukovych said he left Ukraine only after his life was threatened. At one point, his motorcade, Yanukovych claimed, "was shot at by automatic rifles." We posted earlier about the latest developments in the crisis, including the appearance of gunmen in unmarked military uniforms at airports and a Coast Guard base in the Crimea region. Ukrainian authorities say the men are Russian military personnel. Moscow has dismissed such claims. Since Yanukovych left Ukraine, newly installed officials in his nation's government have said they want to prosecute him for mass murder. Dozens of people died last week when security forces cracked down on the protesters in Kiev. "Mr. Yanukovych lost legitimacy as the leader of Ukraine," White House spokesman Jay Carney told reporters early Friday afternoon. Challenging Yanukovych's account of events, Carney said the Ukrainian president "fled, in an orderly fashion," not long after signing an agreement with opposition leaders that was meant to pave the way for new elections later this year. Carney said Ukraine's parliament then acted "responsibly to fill that vacuum" by voting to remove Yanukovych from his post. Carney also noted that "security forces under Mr. Yanukovych's control used snipers in downtown Kiev to kill dozens of civilians."